Thank you OXO for sponsoring today’s recipe. As always, all opinions are my own. If you’ve been following along on Katie’s Cucina for the past few years I’ve focused on one pot meals. In the past year, since having my daughter, Reagan, I’ve focused on one pan meals. They are becoming my new go-to at least 1-2 times each week. I partnered with my friends at OXO to create a sheet pan with a plan meal. Something that is both easy and delicious and will make your dinner time cooking a breeze. I’m constantly trying to think of fun ways to incorporate the food that my son loves but yet not make the same meal over and over again. It’s a good thing he’s Polish because the boy loves SAUSAGE. I mean he asks for it at every meal. The day that I created this recipe I was originally planning to make my normal Italian Sausage Bake dinner. I thought I had Italian sausage on hand but when I went into the freezer all I found was two packs of kielbasa. So I took it out to defrost and started thinking about what the heck I was going to make for dinner. That’s when I decided I would make a different variation of my Italian Sausage Bake but with Kielbasa. 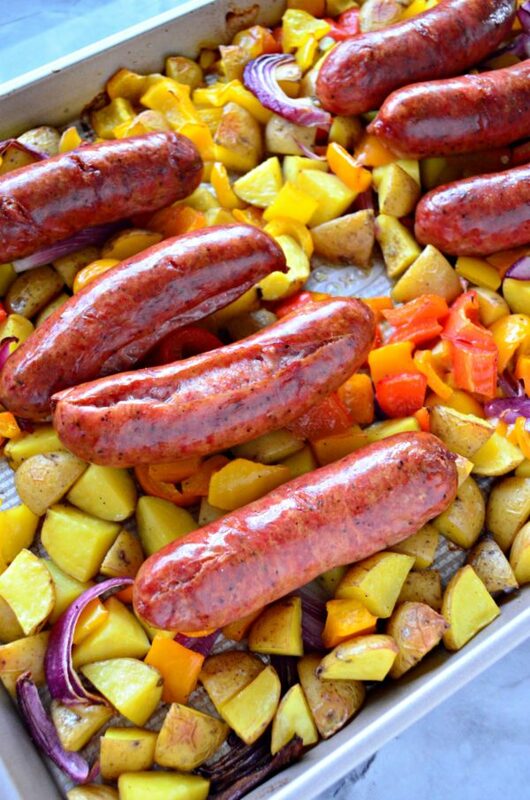 I tried out the OXO Non-Stick Pro Half Sheet Jelly Roll Pan for this sheet pan meal. I love how large and spacious this jelly roll pan is. Best of all it cleans well after cooking which is something I’m always looking for. No kitchen is complete without a Chef’s Precision Digital Instant Read Thermometer. Although kielbasa is a fully cooked sausage and just needs to be heated it’s still important that it reaches up to safe consumable temperature. You want the internal temperature to read 160 degrees Fahrenheit. OXO sent me the following products for this campaign. I’ve actually had a chance to use almost all the products–all products I didn’t previously own so it was a little like Christmas getting new kitchen tools! Chef’s Precision Digital Instant Read Thermometer: The Instant Read Thermometer provides quick, accurate measurements for cooked meat. The pivoting head allows reading temperature from any angle. Silicone Roasting Rack: elevates food above fat and liquid for healthier cooking and allows air to circulate around food for faster, more even roasting. Flavor Injector: inject marinades and other flavorings into meat for delicious flavor and juiciness. Two needles for thick and thin marinades store inside injector tube when not in use. This sheet pan dinner was easy to put together with the right kitchen tools. I layered the kielbasa on top of the potatoes and bell peppers. Just as I suspected the oils and flavors from the kielbasa dripped down into the veggies and potatoes giving another layer of flavor. My family is a “sauce” family. So I served spicy and yellow mustard along side the kielbasa, which is the normal dip for the sausage. My three year old ate it up. In fact, he ate an entire kielbasa link. He even tried a few bell peppers and didn’t make too many faces while doing so. 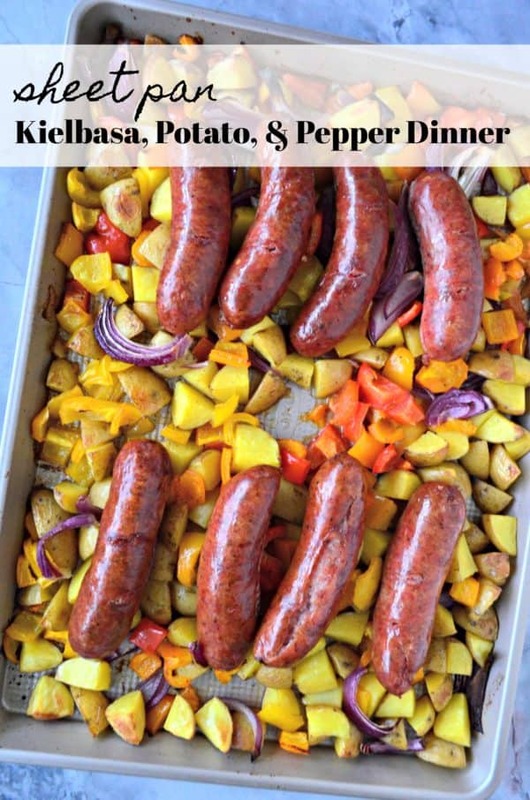 So if your looking to change up your dinner time routine and simplify a little try my recipe for Sheet Pan Kielbasa, Potato, and Pepper Dinner. Preheat the oven to 400 degrees Fahrenheit. While oven preheats place the sliced bell peppers and onions on an Non-Stick Pro Half Sheet Jelly Roll Pan. Rinse and quarter baby potatoes. Place on the baking sheet. Drizzle olive oil over all the vegetables, season with salt, black pepper, and garlic powder. Mix well. 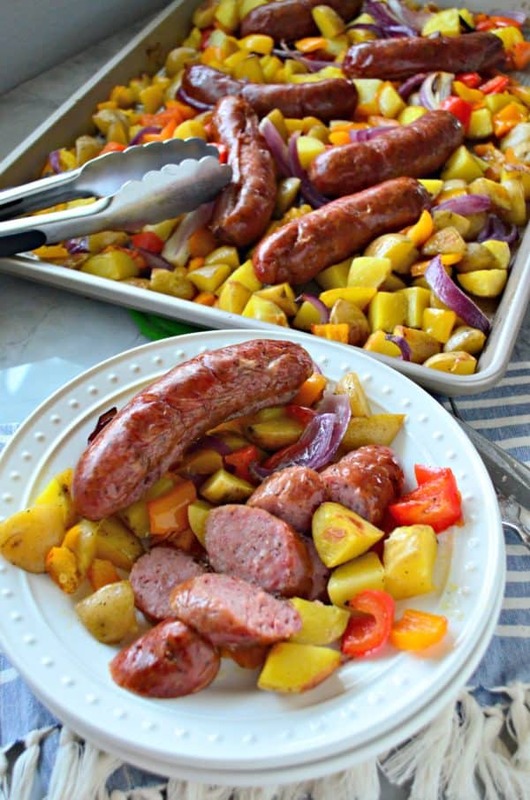 Then place the kielbasa links on top of the potatoes and bell peppers. Cut a few slits in each of the kielbasa links. Place in the oven and cook uncovered for 40 minutes. Remove from the oven, and divide evenly among plates. Enjoy!